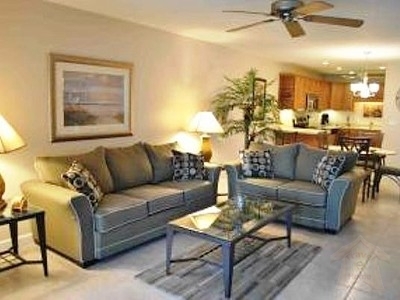 This condo is just steps to the beautiful sandy beaches in Siesta. It\'s the home to a local professional surfer and it\'s a great location for surfers and \"surf watchers\" alike. This Beach house has all the amenities for a comfy retreat. The condo has two bedrooms and two baths. The master bedroom features a wonderful cathedral ceiling, submerged tub and steam shower; a sliding glass door starts up to a private deck with a quiet view of the 2nd fairway. All of the bedrooms, each with its personal bathroom, have king- or queen-size beds, Egyptian cotton sheets and down pillows and bed comforters, TVs, DVDs, music systems and iPod docking stations in each room. Activities while staying at house abound, from golf, shopping, wine tasting, beaches and dining to keeping in and grilling on the deck or cooking in the fabulous kitchen to styling up with a good book in front of the impressive fireplace or in the hammock. The condo vacation rental rates $599 per night. Rates are subject to alter with no notice. The condo is a luxury with a full basket of vacations gifts to enjoy! Contract required; $300.00 deposit to lock dates; deposit credited against rental balance due. 44.80 nonrefundable Insurance fee, 84.00 cleaning fee and admin fee and sales tax of 12.00% are extra.